If you’ve ever lost a pet – even temporarily – you know how nerve-racking this can be. Tagg, a GPS device that attaches to pets’ collars, saves pets’ lives – and gives pet owners peace of mind. Powered by Zuberance, Tagg has activated hundreds of enthusiastic Tagg Advocates to post reviews on Amazon.com and other third-party sites. This program has helped Tagg increase ratings and ranking by 63% in only three months! Note: Tagg does not pay or provide incentives to Advocates for publishing reviews. In addition, the company doesn’t alter or edit reviews in any way. The key is having a system in place that makes it easy for Advocates to create and share reviews. For the Tagg team, Zuberance’s Advocate Marketing Platform was the answer. 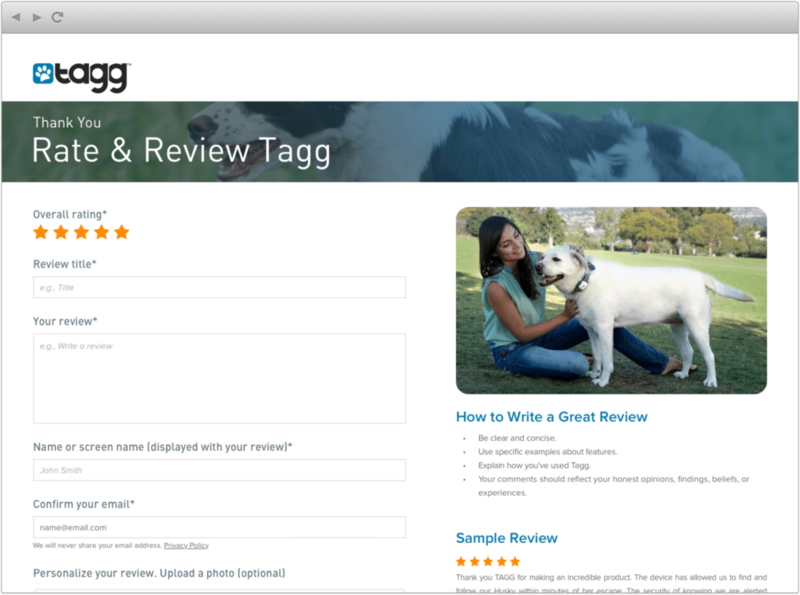 The Platform provides everything Tagg needs to power its successful Advocate Reviews program. It features Zuberance’s hosted reviews application; publishing to third-party sites including Amazon.com, TripAdvisor, Google, Yelp, brand websites, Facebook, Twitter, and elsewhere; integrated analytics; and more. Plus, Zuberance’s professional and technical services team provided planning, design, development, testing, Q&A, program management, reporting, and more. Advocate stories are powerful, memorable, and two times more credible than brand stories, studies show. 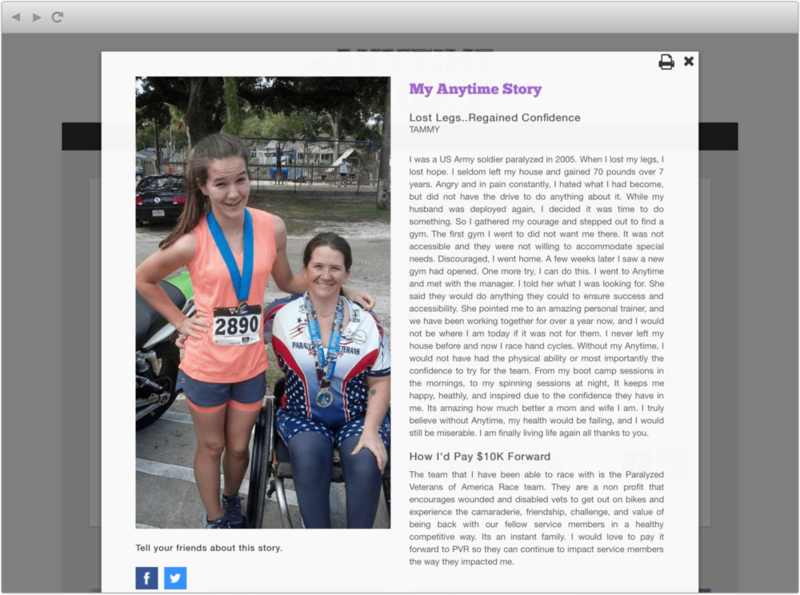 Anytime Fitness, the nation’s largest fitness company, says “My Anytime Story” was its most successful online marketing campaign in 2014. This “pay it forward” campaign featured a compelling incentive: a Grand Prize of $20,000, of which the winner kept $10,000 and donated the other $10,000 to a deserving charity or individual in need. Thousands of Anytime Fitness members created and shared their personal stories and videos, boosting engagement and creating a valuable content marketing asset. Tens of thousands of people voted for their favorite stories and millions more viewed this content. The Zuberance Advocate Marketing Platform powered this campaign. The Platform made it easy for Advocates to create and share stories and videos; vote on and share their favorites; plus earn a spot on the leaderboard. Management features make it easy for marketers to review and approve stories plus track results. Zuberance’s professional and technical services team provided planning, design, development, testing, Q&A, program management, reporting, and more. People love TiVo. 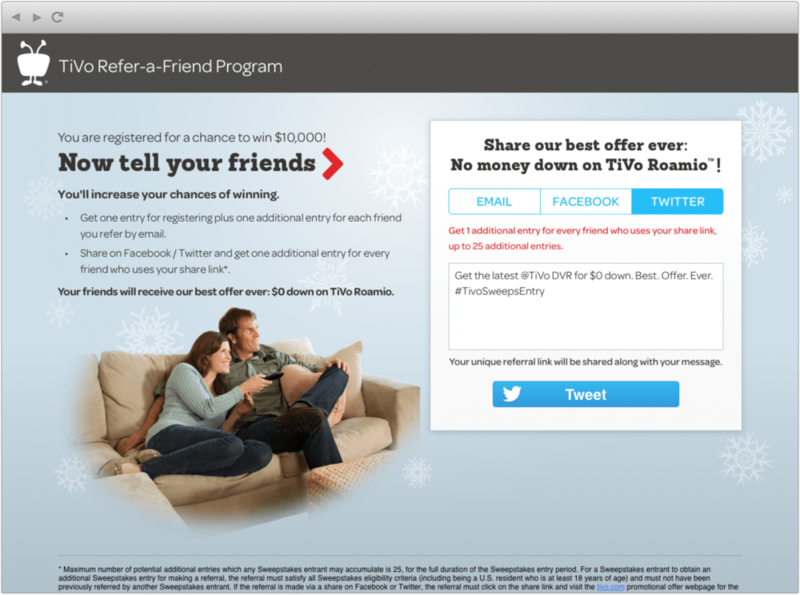 Now, powered by Zuberance, Advocates can share their love for TiVo by referring friends and family. Zuberance’s Advocate Referrals system has enabled TiVo to generate thousands of referral leads plus amplify positive Word of Mouth. Referral marketing is proven to reduce customer and subscriber acquisition costs and generate highly-qualified leads that convert at 10X to 20X higher rate than web leads. And referred customers are about 30 percent more loyal than others, studies show. Unlike self-service refer-a-friend tools, Zuberance Referrals is a complete solution from idea through implementation. It includes our Advocate Marketing platform plus a full complement of professional and technical services. The resort city of Indian Wells, CA (near Palms Springs) tries to woo visitors through all sorts of online marketing campaigns and promotions. What are the best places for sushi in Indian Wells? How do you get tickets for a sold-out tennis match between Roger Federer and Rafael Nadal? Zuberance then automatically routes these questions to Advocates. The answers are sent back to prospects via email along with special offers. Advocates can be rewarded for answering questions with points or other incentives. We also provide SEO-optimized web pages with questions and answers, sort of an Advocate FAQ. We believe Zuberance Answers® is the next big thing in advocacy. It connects Advocates with prospects, driving qualified leads, conversions, and sales.